Township of Langley News Release: Loud, clear, connected, and better equipped to keep themselves and the public safe. That’s how Langley Township firefighters will be working, now that they have joined the E-Comm Wide-Area Radio Network. 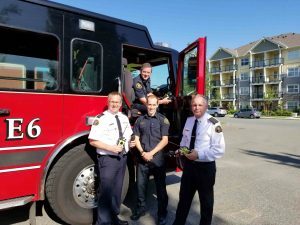 On May 23, the Township of Langley Fire Department became a member of the Network, which provides top-of-the-line equipment to first responders and allows firefighters, police officers, and paramedics to all communicate on the same channels. Read the rest of the news release on the Township of Langley website. Contact Township of Langley Assistant Fire Chief Monty Armstrong or 604-532-7515. L-R: Assistant Chief Monty Armstrong, firefighter Jordan Steeple and Chief Stephen Gamble. Top: Captain Jason Pont.